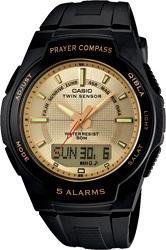 Introducing a selection of new analog-digital combination timepieces specially designed and engineered with the Islamic traveler in mind. 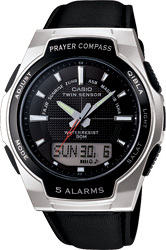 Each one features a built-in prayer compass feature and other functions tat help to ensure you are able to satisfy prayer requirement throughout the day. 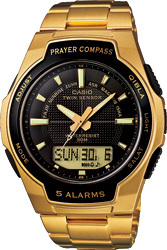 The press of a button causes the second hand to point to Qibla, and the five prayer times for the current day can be determined using the digital display and the second hand. 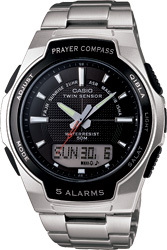 You can even check the prayer times for other dates, if you want. 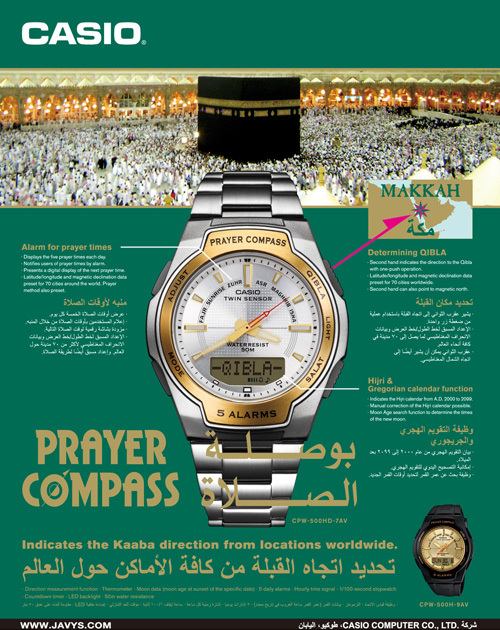 The Qibla feature and prayer time display feature are assigned to their own buttons, which makes operation quick and simple. 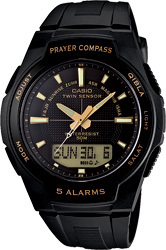 Other features include regular timekeeping, plus dual sensors for direction and temperature, Moon age display, five daily alarms, 1/100-second stopwatch, and a 100-minute countdown timer (in 1-second units). 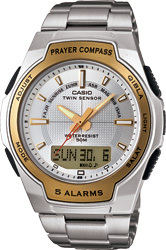 Prayer compass models are also available with a metal band.